It's a truly fall, and fishtastic, experience at the Taylor Creek Visitor Center. 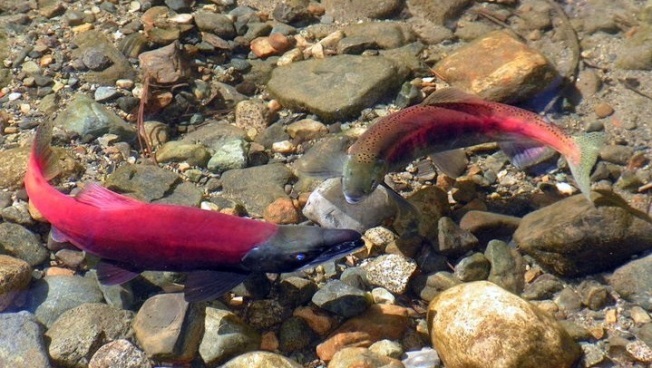 Swim by the Fall Fish Fest, and celebrate the Kokanee salmon, at Lake Tahoe's Taylor Creek Visitor Center. SATURDAY, OCT. 1 AND SUNDAY, OCT. 2: Beyond the show seen in the lake-connecting creek, get ready for a caboodle of nature-sweet happening at the festival, from kidly activities (including the walk-through inflatable fish) to tacos and ice cream. There are some pretty trail runs happening, too, if participating in an invigorating trot is one of your must-dos near the big lake. Above all, admiring this yearly migration is what it is all about, and learning how the Kokanee first arrived at Lake Tahoe, and all of the to-knows about this beautiful aquatic lake dweller. Ready to see a sight not many people experience? It's bucket-list-y, for sure. Watch the mondo fish run, and enjoy a weekend-long salmon-tacular, just a pop north of South Lake Tahoe.